In the world today, Blogger, WordPress, and Tumblr are the best blogging platforms in the online blogging and digital marketing networks. It has become extraordinarily more useful in social media and networking services. These blogging platforms have exploited over 200 million blogs in the whole world. And each one of them, ranked among the top most visited websites. Blogging is described as the quickest and fastest ways of making an enormous success in businesses. It acquires a new pattern that transforms the business into vending; generating leads, sales, and more income. So many successful entrepreneurs and digital marketers testify to that, turning their business skills into multimillion dollar ventures through blogging. It has many other good reasons why you should get started. The best thing about it is that; it’s completely free for everyone. There are so many free blogging sites with different patterns and modification for various purposes like monetization, exposure and the yielding increase in business opportunities. While self-hosted blog requires a domain and personal hosting company, they offer large advantages over the free blogging sites. 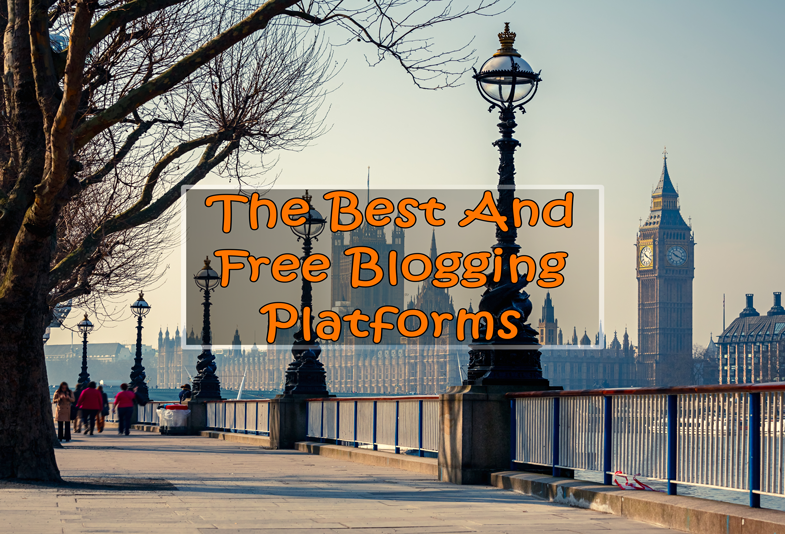 The following are the most popular blogging platforms, all the information on their pros and cons, and why they are the best blogging sites. From the exclusive aspect, we discovered Squarespace, Blogger, WordPress, Wix, Tumblr and Weebly respectively. If, after cross-checking our relative charts, and your choice of platform is WordPress that you need, then following is our guided tutorial to create your blog. You're free to use this info graphic in your blog posts. WordPress is the most popular blogging platform in the world. In every six websites in the world, WordPress is running in it. It is also a great open-source tool used for publishing, it is search engine and content management system (CMS) friendly. It works for everyone from a lower level blogger to large scale business. It has a wild range of free and paid customized themes and plugins. That makes it easier for users. It also enables users to optimize it as per search engine guidelines because it's flexible, scalable and users friendly. As a user, you have a choice to start your blog on Wordpress.com or not, but if you’d ask me then, it can be noted as (not recommended). As building a personal self-hosted blog on your web-hosting and domain using WordPress.org is much more beneficial (highly recommended). When you are aiming to create a professional blog that will make money online and turn your business name to a brand, you need to pay for a web-host from the reliable hosting company. For a special enabling ability to manage your blog like; freelancing and online business services. For, i.e., setting up banner ads, starting online courses, using affiliate links, selling of items and any other ways of actualizing your aim. You are in-charge of your blog and in control of everything including your web designs, third-party plugins, and their functionality. Getting a personal self-hosted blog, can help you to become a serious blogger and it will enable you to make more money online. But, it requires that you invest some money in hosting. I have some good news for you, I’ve made some negotiation of 40% discount with Bluehost, so your hosting expense can be cheap at the low cost of $3.49 per month with the free domain as well. Reliability – Hands are always on deck by the WordPress team, updating software's security and compatibility. Open Source Structure – Blog builders and programmers are encouraged to build thousands of customized themes and plugins. WordPress as an open-source software is highly customizable. Price – Payment can only be made for your hosting and domain. Which entails that WordPress is free software. Flexibility – WordPress enables you to run all kinds of services on it. Selling of items, E-commerce, etc. As it’s simple to operate. SEO Friendly – There are a lot of SEO plugins can be installed. Though, the primary WordPress system is also much SEO-friendly. Coding – Your customization choices, sometimes requires a little coding skill. You can also have a good WordPress blog without coding. In WordPress theme directory you have over 4000 designs of choices and over 43,000 plugins to select the best ones for your blog. Web Hosting – Hosting of WordPress on your server will enable you to get the best from it. Practicalising the activities will demand that you pay for a domain and host. Though, it allows you create a better blog. WordPress have series of many kinds of tools that can be combined to create clean and nice professional designs. But there is small learning curve involved. Not all the blogging platform are qualitative as WordPress. Just note that to be a better blogger you must need to pay for the hosting. As it’ll look more genuine and professional to your blog readers. Initially, Blogspot is the name used for blogger, it is owned by Google back in 2003 and its very popular among the ordinary bloggers, it is normally written or shared online for fun. Blogger is faster in setting up, and it’s easy to use. Stability – With Google support, it is very stable. Simplicity – The platform is very easy and simpler for new beginners and the inexperienced. Lack of Customization – There is no customization in blogger, whatever software platform you are given, is what you will get, even if you try to manipulate the backend codes. Sometimes, it tough and difficult to create the blog of your domain name. Lack of Styles – It has a limited number of theme or designs and no room for additional features and plugins. Lack of Support – It has very limited support from Google Help Center. You may want to share your ideas, thoughts or writing on a blog platform without paying for hosting on the blog. Then Blogger.com is one of the best option available for you. You can set up it within 15 minutes. But also, remember that you might face difficulty in the future. Because converting it to a personal self-hosted WordPress blog isn’t an easy task. Tumblr can also be used for blogging. But it is more like micro-blogging, it has a longer range of tweet which enables users to share visual contents like; links, videos, and pictures. It is advisable for the first time users who are making efforts to start posting, but not to be committed to the project fully. Easy Starter/ Easy Posting – Tumblr blog can be kick-start in less than 5 minutes as it only requires publishing. Pick a post type example; image, link, video and text, insert the content and click “publish”. A great example is Coca-Cola blog. Managing Multiple Blogs – Its basic control panel makes it easier to manage multiple blogs. Design Options – Tumblr has a right combination of features and themes you can choose from. Mobile Friendliness – Tumblr blogging is mobile friendly through apps and support blogger desires of making post using SMS, e-mail or audio message. Not Optimized for Text or Writing – Tumblr’s design is so highly visual that text-heavy blogging is discouraged. If you are interested in building a high traffic website focused on written content, Tumblr should be your last choice. Otherwise, Tumblr can be an excellent choice for a humor blog utilizing memes, images, and/or videos. Security Measures – Tumblr is high in its security measures as it is controlled by the security team on the backend. So, it is not like a self-hosted platform which requires additional security plugins. Irrelevant Content – Tumblr activities of distributive measures is being discovered as irrelevant content in the usual blog, especially the written content. Tumblr is known as the best free blog sites for ordinary bloggers who are engaged in the activities of the visual contents of; Photographs, humor, food, arts, etc. It has nothing to do with professional appearance. Nevertheless, looking into the software; WordPress, Blogger, and Tumblr. The values of the WordPress are the best. Many bloggers have different reasons for starting up a blog with “WP” because it has different features put together. As, I’ve mentioned before like; Flexibility, power, user-friendliness and design. Blogger and Tumblr have simple features but not as compare to WordPress. Are you interested in acquiring knowledge of how to make money online through blogging and set up a personal self-host blog? Our guide to setting up WordPress blog will be of real help. Check it out here.